AVForums have three copies of MECHANIC: RESURRECTION on Blu-ray to win. Hollywood hardman superstar Jason Statham returns as the elite, globe-trotting hitman in this slam bang, full throttle sequel to the 2011 box office smash, starring Jessica Alba and Tommy Lee Jones (Oscar winner for The Fugitive), and featuring astounding set pieces, exotic locations and non-stop action. 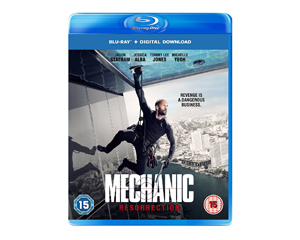 MECHANIC: RESURRECTION is available on Digital from the 19th of December and 4K Ultra HD Blu-ray, Blu-ray and DVD on the 26th of December 2016.